A Collage of Thoughts on Prayer is a collection of sayings about prayer and excerpts from Scripture. There are various ways to use this paper. You could stick it on your refrigerator or put it on your bulletin board, or you could put it in a drawer or book and let it find you when you need it. COME AS YOU ARE…THAT’S HOW GOD LOVES YOU. Take ten minutes each day to simply allow God to love you. Like setting a plant on a window sill to soak up the sun, we come before God to receive God’s love, healing and acceptance. Listen to God when you pray, and tell God how the listening makes you feel. Prayer is about loving friendship with God, so speak with Jesus as a best friend. Paying attention to anything closely can lead to experience God and a deeper relationship with God. Notice something beautiful each day and adore God in it. Prayer is meant to be an uncomplicated gesture of love. Clinging to a specific understanding of God can inhibit genuine encounter with God. Perhaps God’s best name is SURPRISE. Prayer is abiding (remaining) in God, like the vine and the branches (Jn 15:1-17). The daily examen (review of the day) can be a powerful way to become more aware of God’s presence in our lives. Be gentle with yourself. Loving your neighbor as yourself also means loving yourself as your neighbor. If struggling in prayer, ask God for help (Lk 11:9-13). If your soul is hungry, feed it beauty. During prayer, there may be distracting thoughts or feelings. Rather than attempting to repress these distractions, it is often better to allow them to surface, to recognize them, name them, accept them and to let them go. Sometimes these distractions may resurface later precisely because God wishes to reveal something to us regarding them. Two things are needed for spiritual growth – desire and prayer. Allow enough time to become silent – to hear the small, quiet voice of God (1 Kg 19:11-13). We encounter God not in the past, nor in the future, but in the present moment. Each day is another opportunity to encounter God, a new beginning. So if you decide you wish to see a spiritual director, how can you find one who is a good fit for you? There is a list below, however the descriptions provided on this list are helpful only to a point. Clarence Heller (the coordinator for this ministry) knows each person on this list and welcomes you to contact him (314-258-9066; clarenceheller@gmail.com) to narrow it down based upon what you are seeking in a spiritual director. Also, keep in mind that as much as you want to have a good fit with a spiritual director, a good spiritual director wants that fit for your sake as well. It is common for spiritual directors to periodically review with those they companion whether the spiritual direction relationship continues to be helpful and how it could be made more so. Pat Bauer, SSND (314-351-6619) [St. Louis, 63139] E-mail: pbauerssnd@yahoo.com; School Sister of Notre Dame. Retired high school teacher, experienced retreat and prayer guide, with background in Ignatian spirituality. Certificate in spiritual guidance from Siena Retreat Center in Racine, Wisconsin. Member of Spiritual Directors International. Facilitates groups focused on Spirituality of Recovery from homelessness and addiction. Interested in guiding others to a deeper awareness and experience of God’s unconditional love, recognizing that everything in life is meant to move us forward. Robin Black-Rubenstein (618-406-5562) [Metro-East, Edwardsville 62025] E-mail: rblck62@yahoo.com; Married, Roman Catholic Laywoman with two adult daughters and two adult step-daughters. Director of Campus Ministry Southern Illinois University Edwardsville IL, Spiritual Director, Retreat Leader, Certified Grief Counselor. MA Pastoral Studies and MA Certificate Spiritual Direction Aquinas Institute of Theology, Certified Grief Counselor – American Academy of Grief Counseling. In listening to your story, we are listening together to how the divine is working in your life through people, nature, service, and self-knowledge. Available for Spiritual Direction, Grief Counseling, all faiths welcome, Metro-East and St. Louis area meeting in a location most suitable for your needs, or by phone and/or Skype. I am also available for retreats and speaking. Catherine Blattner (314-537-6644) [St. Peters, 63376] E-mail: cblattner1@hotmail.com; Catholic laywoman, single parent, grandparent. Special interest in centering prayer and in the practice of being an active contemplative. Long time registered nurse with sensitivity to those who are professional or family caregivers. My own spiritual path has been greatly influenced by the telling of the new universe story and its implications for our relationship to the divine as well as to all of creation. Certificate in spiritual guidance from Siena Retreat Center in Racine, Wisconsin. Jared Bryson (618-670-9570) [St. Louis] E-email: jared.bryson@chaplain365.com or jaredhbryson@gmail.com; Jared is a Married Roman Catholic, father of three and is an oblate of St. Benedict of St. Meinrad Archabbey. He currently ministers as a workplace Chaplain and as the Vice-President—Mission. He holds a Master of Divinity degree from Aquinas Institute of Theology in St. Louis and a Doctoral Degree in Christian Spirituality from Washington Theological Union in Washington, DC. He is has served as a Spiritual Director for individuals and for 19th Annotation of the Spiritual Exercises. Jared has spent 20 years in retreat presentation, Spiritual Direction, parish and seminary education and health care ministries. He teaches in the Certificate for Spiritual Direction program that is offered by the Monastery of St. Scholastica. He is a member of Spiritual Directors International and the Society for the Study of Christian Spirituality. Will meet with folks in the St. Louis area. agnes.chawadi@gmail.com; I am a Catholic woman with 30 years of life as a religious nun, travelled 21 countries to assist parishes develop participatory structures for effective community building. Experienced in retreats, Eastern spirituality, spiritual direction, intuitive to the promptings of the Holy Spirit and personally committed to God seeking. God has blessed me with gifts to help people move from fear based life to love as foundation of daily lived experience. I am interested in accompanying individuals and couples seeking to live life to the full and realize, “Our only desire and our one choice is: I want and I choose what better leads to God’s deepening life in me.” – From the Principle and Foundation written by St. Ignatius Loyola (paraphrased by David L. Fleming, S.J.) Spiritual direction is an opportunity to learn from the Holy Spirit, how to sharpen our human skills and manage inner life. In doing so we will be able to free our divine light to shine to its full potential. nezloh@mindspring.com; MA Pastoral Studies and MA Certificate Spiritual Direction-Aquinas Institute of Theology. Certified Pastoral Minister – Archdiocese of St. Louis. Married Catholic laywoman; mother of three sons, two adult and one deceased. Spirituality Interests: Meeting points of Eastern/Western spirituality; Various types of prayer; Living in a spirit of gratitude; Connections between the daily ordinary and the Holy; Journaling and/or the creative process (painting, drawing, collage making, “sacred” walks, photography, etc.,) as tools for spiritual expression and growth; Group and private directed retreats. Open to all faith traditions. Adjunct spiritual director – Mercy Center. Meet with directees at Mercy Center or place of directee’s choosing within a reasonable distance. Also meet by Skype or phone. Helen Ann Collier, CCVI (636-284-7666) [St. Charles, 63303] E-mail: helencollier70@gmail.com; Sister of Charity of the Incarnate Word. Earned certificates in spiritual direction from Mercy Center, Burlingame, CA and Mercy Center in Colorado Springs, CO. Served as Associate Director/Spiritual Director at the Sangre De Cristo Center in Santa Fe New Mexico and as spiritual director in the MTM sabbatical program at the Oblate School of Theology in San Antonio Texas. Served on the Provincial Leadership Team in her community both as Provincial and Director of Ministry. Dr. Devoree Crist (314-962-1031) [Webster Groves, 63119] E-mail: dcrist@ymail.com; website: http://spiritualdirectioninwg.net; Christian Church (Disciples of Christ) with Roman Catholic roots. Married woman with two adult children who is experienced with and welcomes persons of diverse backgrounds and faiths. Has been blessed to walk with clergy, young adults, older adults, and couples. Ministry is accompanying those desiring a closer relationship with God, discovering ways to recognize, savor and grow from encounters with the Sacred and exploring how we can become more aware of the Holy in all aspects of life. Special interests include liturgy (ritual), art, music, and writing. Masters of Theological Studies from Eden Theological Seminary, Certificate in Spiritual Direction from Aquinas Institute of Theology, and a Doctor of Medicine from Washington University School of Medicine (retired). Valerie Dalton (636-441-1425) [St. Charles, 63303] E-mail: spirit13@swbell.net; Ecumenical, Catholic, Laywoman, married with five Children, eleven grandchildren, one great grandchild. Masters Degree in Pastoral Studies, Spiritual Direction Certification, Biblical Studies Certification from Aquinas Institute of Theology. Small business owner with husband for thirty six years, dancing school teacher for ten years, involved in adult faith formation for over twenty five years at St. Robert Bellarmine Parish. Led by the Spirit from childhood into deeper relationship with The Holy, as well as helping others to grow in their relationship with God. Also experienced with group spiritual direction. Kathleen Davis (314-575-7363) [Kirkwood, 63122] E-mail: kmgdavis@gmail.com; Holds MAPS and Graduate Certificate in Spiritual Direction through Aquinas Institute. Available for spiritual direction as well as retreat leadership. Passionate about working with companions to discover their deepest truth and claim their original goodness. Open to directing people of multiple faith backgrounds. Married laywoman, mother of three, adjunct instructor at Aquinas Institute. Erin Duffy-Burke (314-827-6804) [St. Louis, 63118] E-mail: erinduffyburke@gmail.com; websites: www.interweaveministries.com, erinduffyburke.com; prefers the name “spiritual companion” or “midwife of the soul” to spiritual director. She considers it a great honor and privilege to walk with those seeking deeper relationship with the One who gives all life and love. She is amazed at what happens when two gather to attune to the movements of the “golden thread” — the weaving of the Divine in our human life. She is an experienced minister and soul companion, having walked alongside seekers for over fifteen years now. She is also a yoga teacher and facilitator of embodied transformation, and loves incorporating these embodied sources of wisdom into soul work, should that be something that serves you. She holds an M.Ed. from the University of Notre Dame, an MA in Multicultural Ministry from the Franciscan School of Theology, and an MA in Christian Spirituality from the Graduate Theological Union. Jill Fisk (314-973-2688) [St. Louis, 63119] E-mail: jillefisk@gmail.com; Jill is a spiritual director, yoga and meditation instructor, and retreat facilitator. She holds a graduate certificate in spiritual direction from Aquinas Institute and is currently pursuing a Master of Divinity from Fuller Theological Seminary. Her interest in meditation grew after becoming a mother when she craved moment-by-moment connections with God. This led to her passion for teaching and leading others in prayer. Her methods include physical postures, breath prayer, praying Scripture, imaginative prayer, and centering prayer. She meets with individuals and groups in Webster Groves or via Skype or Facetime. Mary Flick, CSJ (314-952-5581) [St. Louis, 63111] Email: mflickcsj@gmail.com; A Sister of St. Joseph of Carondelet. Currently serves as justice coordinator for the CSJs and is a writer. Certificate in spiritual direction from Aquinas Institute of Theology. Has a passion for things Ignatian and is a speaker on Ignatian spirituality, prayer and discernment. Interested in encouraging others to develop a relationship with an ever-faithful God, who desires the same. Steve Givens (314-401-2072) [Creve Coeur, 63146] E-mail: givenscreative@gmail.com; website: www.givenscreative.com; A Catholic married father of two adult children, I earned a certificate in Spiritual Direction from Aquinas Institute of Theology. I am a widely published author on Catholic-Christian spirituality and prayer and have an ecumenical heart and outlook on the Church. I have a great interest in the intersection of faith and creativity and a passion for working with artists, writers and other creative individuals. A survivor of a rare blood disease and author of “Embraced by God: Facing Chemotherapy with Faith,” I am also interested in working with those struggling with health issues. Available for workshops and retreats, as well as spiritual direction. Available in North County at Walter’s Walk Counseling in Hazelwood, in West County at my home or at Incarnate Word Parish in the Chesterfield/Creve Coeur area, and in the University City/Clayton area, as I work at Washington University and am available during the lunch hour. Also available via Skype. Carolyn Griffeth (341-588-8351) [St. Louis, 63106] E-mail: cdgriffeth@yahoo.com; “Carolyn holds the hand of your Soul allowing it to go just where it needs to go.” This is how a directee recently described my work. Struck by her words, I asked: “How do I do such?” She responded, “By using everything you’ve learned holding the hand of your own soul through so much fire!” Her words describe my work well: It is an honor to hold space for you as you open to your Soul. Sometimes the first voice of Soul is grief; always there is a longing to transcend the smallness of limiting beliefs and oppressive conditioning and open to wider dimensions of faith and life! My tools are passionate prayer, contemplative practices, cultivating consciousness, dream work, emotional release work, oppression awareness, grief work, and earth centered ceremony. Those who work best with me are ready for expansion or desiring to grow their spiritual wings. All faiths, gender identities, sexual orientations and ethnicities welcome! Carolyn has twenty plus years of experience in the Catholic Worker movement and working for social change–an on-going passion. In 2003, she graduated from Aquinas Institute with a MAPS degree and certificate in spiritual direction. She also holds a degree in Shamanic Energy Medicine, and leads women’s groups, and workshops on whiteness and dismantling oppression. Carolyn has a background in the UCC, Catholic, and Quaker tradition. Currently, she serves as facilitator of a womenist spiritual community called Spirit Rising, which unites spirituality with liberation. Vicki Harpring (314-831-8988 or 314-609-9304) [Florissant, 63034] E-mail: vharpring@yahoo.com; I am married with grown daughters and 2 grandchildren. I am Protestant Christian excited about journeying with others on their faith path, involved in Ignatian Spirituality in the St. Louis area and Moments of Grace and Prayer. I work as an RN in a local emergency department and have a Masters of Pastoral Studies (MAPS) from Eden Theological Seminary and a certificate in Spiritual Direction from Aquinas Institute of Theology. Judith Hehl (314-835-1554) [Kirkwood, 63122] E-mail: judith.hehl@gmail.com; Divorced/Widowed layperson, I see people in my home in Kirkwood. I have 4 children, 10 grandchildren and 10 great-grandchildren, all living out of state. I received Certification from Aquinas in St. Louis in 2002. Interested in 12 step and Eastern spirituality as well as Christian. I am able to listen deeply, with compassion and love, helping others explore the sacred ground of their lives. I believe that “God shows up disguised as your life” and will show us the “golden thread” to follow if we take the time to listen and look. Consider myself a midwife, more that a director. Christy Hicks (573-418-7373) Email: christy.hicks@slu.edu; Christy is a Campus Minister at Saint Louis University. She has been ministering to young people for over ten years primarily in the field of Campus Ministry. Christy completed her spiritual direction certificate at the Aquinas Institute of Theology and her MA in Pastoral Ministry from the University of Dayton. She is open to all who are interested in exploring their own faith journey and sees every path as unique to the person. Several years ago she spent a year in India and Nepal, and though her studies have been through the lens of Catholic-Christian faith and thought, she reverences the perspective and beauty that other faith traditions share. The fee is on a sliding scale. Bob Hoffman (314-791-3553) [Wildwood, MO 63038] E-mail: bob@hoffman8.com; Married, Roman Catholic Layman with ecumenical view. Father of six children including several adopted children. Lifetime businessman, now spiritual director. Certificate in Spiritual Direction from Aquinas Institute of Theology, enrolled in MA Pastoral Studies at Aquinas, certified in MBTI, experienced in Enneagram, adoptions, 12-step programs, addictions, prison work, retreats, etc. Love of nature and poetry. Believes that direction is about recognizing and loving God in our everyday lives and experiences. Meets directees at Mercy Center on Geyer Road or other mutually agreeable location. Veronica Gumja Kim, CDP (412-316-6263) [Pittsburgh, 15237] Email: vkim@cdpsisters.org; A Sisters of Divine Providence in Pennsylvania. Currently Assistant Director of International Student Service of the college, and Director of Mentors, as a Director of Formation in the congregation. Certificate in spiritual direction from Aquinas Institute of Theology. Certificate in Formation Director Training Program from Religious Formation Conference. Over ten years of experience with spiritual direction individually or group. Experienced with Director of Retreat Center. Former vocation director in the community. Meet with directees at a retreat center or place of directee’s choosing within a reasonable distance. Willing to do spiritual direction by Skype or phone. Welcoming to meet directees in Korean and English. Madeleine Lane, SSND, MA, LMFT (314-963-9600, ext. 3) [Webster Groves, 63119] E-mail: msl524@aol.com; a member of the Central Pacific Province of School Sisters of Notre Dame. She is the director of The Family Center with thirty-five years of educational, pastoral and clinical experience, including spiritual direction. Sister Madeleine offers individual, couple, and family counseling, and specializes in grief ministry. She also serves as a guest speaker, facilitator, work shop presenter and is an adjunct university professor. Marian Love (314-496-6157) [Fenton, 63026; St. Louis, 63108] E-mail: flourishfaith14@gmail.com; Roman Catholic married woman with two grown children and six grandchildren. Experienced retreat and spiritual director, with background in Ignatian spirituality. Interested in guiding others to be more reflective of life, God’s presence and movements within it, and one’s response to these movements. Holds a Masters in Pastoral Studies and a Spiritual Direction Certificate from Aquinas Institute of Theology. Jo Ludwig (314-805-1702) [Dardenne Prairie, 63368] E-mail: KJLCSTL@aol.com; Website: www.josephineludwig.com; Christian-Catholic lay woman. Happily married and mother of two adult women. Experience with healing and recovering from illness or traumas, including addictive behaviors. Educated at Aquinas Institute with Masters in Spiritual Direction (2009) and a Masters Degree in Professional Counseling (Lindenwood University 2011). Experience with multiple forms of prayer and spirituality. Ecumenically minded. Enjoys exploring the stories of people’s lives in their walk with our great God. Background in health care as a pharmacist. Cindy Mackey (618-628-1992) [O’Fallon, IL 62269] E-mail: cindy.mackey@sbcglobal.net; Catholic laywoman, married with one grown daughter. Masters of Theology and Certification in Spiritual Direction from Aquinas Institute of Theology. Background in teaching, coaching, and military service. Experienced spiritual director and retreat leader. Passionate about serving others of all ages, all backgrounds, and all who seek a life more fully present to God and others. Willing to do spiritual direction via Skype or FaceTime. Maureen Martin, ASCJ, (203-606-9105) [St. Louis, 63018] E-mail: mmartin@ascjus.org; Catholic sister, Apostle of the Sacred Heart of Jesus with a certificate in Spiritual Direction from Aquinas Institute in St. Louis. Experienced in teaching and educational administration; practiced compassionate listening in community leadership. Worked with young and older adults in busy persons retreats and week of guided prayer, personal spiritual direction and grief ministry facilitation. With caring, compassionate listening and sharing, God’s Spirit fosters deep insight and personal courage to discover new directions. Jane McKinney (618-978-9608) [Edwardsville, IL 62025] E-mail: mckinney.jane68@gmail.com; Christian; ordained in Pastoral Ministry; retired R.N. and hospital chaplain; Aquinas Institute Graduate with Master’s in Pastoral Studies; Certificate in Spiritual Direction from Institute for Spiritual Leadership, Chicago. Widowed, mother of two grown children, two grandchildren. Compassionate listening as one navigates his/her spiritual path seeking a deeper awareness of God in all things. Carolyn McWatters, RSM (314-258-3936) [St. Louis, 63131] E-mail: scmcw2001@yahoo.com; Carolyn is a Sister of Mercy of the Americas, South Central Community. She has a certificate in Spiritual Direction from Aquinas Institute of Theology. Carolyn sees spiritual direction as a ministry of accompaniment in which both director and directee strive to be attentive and responsive to the movement of the Spirit in the directee’s life. All aspects of a person’s life provide the context for this exploration. One of the tasks of Christian discipleship is to grow in awareness of the pervasive presence and action of God in this world. Spiritual direction is a reverent process of gently looking at one’s experiences so as to deepen this consciousness and grow in one’s relationship with God. Joan Moorhem, SSND, MA (314 845-1571) [St. Louis] E-mail: jmoorhem@ssndcp.org; Extensive experience in university education (Japan); human services (USA); and spiritual direction/retreat guidance. Trained in Ignatian spirituality, but comfortable with other traditions as well, including Eastern meditation. For me, spiritual companioning means walking with and reflecting with another as (s)he seeks to recognize and live more deeply God’s Spirit in her/his daily life. My core belief is that “the glory of God is the human person fully alive.” I am available for spiritual companioning in my home or at another mutually agreeable location. Janet Nimer (636-227-0772) [Ballwin, 63011] E-mail: nimjan@sbcglobal.net; Roman Catholic married laywoman, mother and grandmother; active in both Bridges and in one on one spiritual companioning. My hope is to assist others in fostering a contemplative approach to life; helping them to recognize their life experiences as the HOLY GROUND through which the Divine is encountered. Sharon O’Grady, RGS (307-399-1938) [North County, 63121] E-mail: sharonorgs@msn.com; MA in Pastoral Counseling, La Salle University; certificate from Ministry Training Services, Denver; Certificate in Spiritual Direction from Aquinas Institute of Theology. Familiar with centering prayer and the enneagram. Sees spiritual direction as companioning another as they seek, and discover the presence and action of God within their everyday life experience. This spiritual direction conversation coupled with prayer and reflection leads to possibilities of a deeper relationship with God and to ongoing conversion and commitment. Other relative previous experience includes ministering in an alcohol/drug recovery program, prison ministry and pastoral care in a nursing home. Carol Orf, CPPS (314-560-1028) [St. Charles, 63303] E-mail: corf@cpps-ofallon.org; Carol is a Sister of the Most Precious Blood who has worked in vocation and formation for many years and is now co-director of the Sanguis Christi Spirituality Center in O’Fallon, MO. She is a good listener and feels honored to tend the holy in herself and in another. She completed an Internship in the Art of Spiritual Direction at Mercy Center in Burlingame, CA. Roman Catholic laywoman. Widowed with three grown daughters and two grandsons. A compassionate listener with background in Ignatian Spirituality. Prayer companion in the Bridges Program. Holds a certificate in Spiritual Direction from Aquinas Institute of Theology. Desires to assist others to encounter the presence of God in their lives. Honora Remes, DC (314-873-1131) [Maryland Heights, 63043] E-mail: Honora.Remes@doc.org; Daughter of Charity and a seasoned Spiritual Director with certification from the New Orleans Archdiocesan Spirituality Center as well as receiving her MA in Christian Spirituality from Creighton University, in spiritual direction. She is experienced in on-going direction, 8-day retreats, the 19th Annotation, Ignatian spirituality, Enneagram wisdom and dream work. Available also by Skype or Zoom. David Sandel (217-766-6237) [Champaign-Urbana, IL 61801] E-mail: davesandel@gmail.com; Christian counselor and minister (Christian Church/Church of Christ). Certificate in spiritual direction from Chiara Center, Springfield, Illinois. Trained in interpreting the Enneagram and Myers-Briggs Type Inventory. Margaret and I have three grown children. We lead couples retreats focused on Sabbath and spiritual practices, and meet individuals in our home office or by phone/Skype. Lots of experience with clergy, students and couples. Focus on prayer – including lectio divina, conversational prayer, contemplative prayer, worship, healing touch, and laughter. Margaret Sandel (217-344-2436) [Champaign-Urbana, IL 61801) Email: margaretsandel@gmail.com; retired teacher, former prayer minister with Vineyard Christian Fellowship, volunteer counselor at Hope Center in Urbana. Certificate in spiritual direction from Chiara Center, Springfield, Illinois. Trained in interpreting the Enneagram and in administering the SYMBIS Pre-Marriage Assessment. David and I lead couples retreats focused on Sabbath and spiritual practices. We have three grown children. We meet individuals in our home office or by phone, Facetime or Skype. Focus on listening to God together, opening ourselves to God’s healing, prophetic prayer, second half of life – and the dark night, dreams, and worship. Lorraine Senci (618-604-1891) [Troy, IL 62294] E-mail: lsenci@gmail.com; Married Catholic laywoman who is a mother and grandmother. Feels blessed to companion others on their faith journey by offering compassionate listening, gently accompanying directees who desire to become more aware of God’s presence in the conversations, events and relationships of daily life. Completed a master’s degree in pastoral studies and the graduate certificate in spiritual direction program from Aquinas Institute of Theology. Serves in parish ministry as a pastoral care associate. John Shaughnessy (636-256-4843) [Chesterfield, 63017] Email: JShaugh508@aol.com; Roman Catholic married layman; a parent and grandparent; experienced in secondary school and college teaching and in district administration in public schools; has served on private Catholic schools boards of directors; active in parish ministries in St. Louis county. Values spiritual direction as a way to assist those searching to integrate spirituality with everyday life and work; experienced in Ignatian Spirituality; has a background in contemplative prayer. Certificate in Spiritual Direction from Aquinas Institute of Theology and a Prayer Companion in the Bridges Program. Lucia Signorelli (314-323-0209) [Creve Couer, 63146]. E-mail: luciasignorelli@sbcglobal.net; Compassionate listener to another’s sacred story of how God draws him/her to the fullness of love. Companion and guide in exploring, finding, and responding to God’s love revealed in all things. Certified in spiritual direction from Aquinas Institute. Life-time ministry in education. Experienced in coaching, retreat work, and faith formation. My faith tradition is Roman Catholic and I am open to all who sincerely seek God in their everyday life experiences. Scott Sparks (314-517-0770) [St. Louis, 63146]. Email: scott_sparks@outlook.com; Involved in several ministries including, Secular Franciscan Order, Knights of Columbus, Jonah Prayer Ministry, and retreat leadership. Special interests include Franciscan spirituality, contemplative prayer, addiction recovery, healing/deliverance, charisms, formation/consecration, and discernment of spirits. Graduate of Aquinas Institute of Theology and a member of Spiritual Directors International and the American Association of Christian Counselors. Mission: To be a companion of those on the spiritual journey of growing closer to God by listening for God’s call and asking questions that help articulate what is happening and formulate a response. Open to all spiritual backgrounds. Mary Taylor (314-952-2448) E-mail: mzt3522@gmail.com; Episcopal lay woman interested in contemplative approach to spiritual direction and listening deeply to your life’s path and where God may be leading you. As a guide I am joining a conversation already going on between you and God. I meet with young adults, professionals, clergy, and others of all faiths, and in Group Spiritual Direction. Experience with 12 step programs. Also serve as lay Chaplain in hospice and have a listening ministry with incarcerated individuals. Certificate in Spiritual Direction from Shalem Institute for Spiritual Formation, Washington, D.C. Two locations: Emmanuel Episcopal Church (Webster Groves) and Mercy Center (Frontenac). Lisa von Stamwitz (314-795-0114) [St. Louis, 63119] E-mail: Lvonstamwitz@netzero.net; Married Catholic lay person. As a Spiritual Director, I seek to companion others on the incredible journey of discovering God’s beauty and light in the essence of their being, out of which they more fully manifest God’s love on the Earth. Familiar with Native American spirituality, the12-step program, inner listening and discernment, as well as integral spiritual practices to support body/mind/spirit connection and balance. I am an RN with an MA in Transforming Spirituality and training in Spiritual Direction from Seattle University. My background includes church ministry, parish nursing as well as professional storytelling. wcyarbrough@gmail.com; Serving diverse traditions, Bill is married, a parent, grandparent, pastor, coach, mentor, trainer, spiritual director and leads group or private retreats. Together with his work as a pastor and spiritual director, Bill works internationally with a church-based non-profit. In Spiritual Direction, Bill is deeply committed to creating safe and sacred spaces for directees to experience God’s presence, freedom, and their own feelings and serves to foster listening, exploration, and discovery, all bathed in God’s promises and the expectancy of personal, community, and global transformation. Bill holds MDiv/DMin degrees from Covenant Theological Seminary, a certificate in Spiritual Direction from Aquinas Institute of Theology, and a certificate in Franciscan Studies from the University of St. Francis in Joliet, IL. The community of spiritual companions in this ministry has assembled a list of their favorite books which includes not only the title and author, but also brief descriptions for each book. The author explores spirituality for busy lives. Using stories from a variety of religious traditions, including Taoist, Jewish, and Christian, Palmer shows that the spiritual life does not mean abandoning the world but engaging in it more deeply through life-giving action. Palmer shows us how the problems and potentials of the active life reveal to us much about ourselves, the world, and God. This book is a very helpful, engaging introduction to prayer as a personal relationship. The author gives many examples and suggestions that are down to earth, honest and easy to understand. This book combines both theory and practice to gently guide the reader through the first steps of contemplative prayer. May addresses the problems faced by all who deny themselves loving relationships with others and with God by the compulsive drive for efficiency, recognition and success. He draws on the wisdom of biblical prophets as well as philosophers and wisdom figures such as St. Francis de Sales, Teresa of Avila, William Blake, Martin Buber and Thomas Kelly. May gives considerable attention to the techniques, disciplines and pitfalls inherent in developing a faithful prayer life. The author gives personal examples from his life and reflects on the inspirational life and writings of holy men and women, including Thomas Merton, Henri Nouwen, Therese of Lisieux and Pope John XXIII. Helps each of us to see how becoming who you are and the person God has created is a simple path to happiness, peace of mind, and holiness. Sr. Katherine Hermes draws from the writings and teachings of spiritual giants such as Ignatius of Loyola, Brother Lawrence, Julian of Norwich and from classic texts such as the Cloud of Unknowing to gently guide the reader through the steps of drawing closer to God. Each chapter provides step by step exercises to guide and draw the reader to contemplative prayer. A wonderful orientation to centering prayer and its fruits. Father Keating, leader of the Centering Prayer movement, understands the contemplative and prayerful life as a form of participation in the suffering, death, and resurrection of Jesus, and his book is both a graceful description of that life and a how-to. The cup is the symbol of life, filled with sorrows and joys that we can hold. Lift and drink to the bottom as a blessing and a way to our unique freedom and salvation. Written by a former Trappist monk who studied closely with Thomas Merton, this book offers a simple and clear explanation of the ancient practice of meditation. Not only a source for learning, I found this book to offer encouragement for the spiritual life and enflamement of my yearning for God. This book explores the relationships between the seasons of the earth and the seasons of our lives, and helps us discover stepping stones along the path of the great circle of life which is our journey. We are invited to connect with experiences of the unfolding seasons with our spiritual growth and movement, and to know the presence of God in the midst of them all. 108 brief reflections in “stand alone form,” so the chapters can be used according to theme, such as “Hope and Fear,” “The Empty Boat, etc. Many of the reflections are rooted in Pema’s practice of Tibetan Buddhism, but are helpful to any spiritual seeker. This little book is the gift of a discerning heart who offers both practical and inspirational wisdom to those who would live a discerning life. This is written primarily for directors and guides. He shows the precision, clarity and insight for Ignatius’ rules; and why Ignatius is still important today. A remarkable collection of words and images that remind us of the presence of God in each moment. 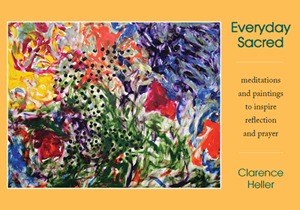 This lively book of poetry, prayers, and paintings will engage your heart and open your spiritual senses. The result is a feast of love for the senses and the soul. Amidst the conflicting values in which we live, the author leads us through parables and personal experiences to a new way of seeing life, and to a place of contemplation. A deeper personal relationship with God requires not only belief in a loving God, but the experience of that love on a feeling level. This book guides the reader in discovering, entering into, and experiencing God’s tremendous love. Prayer exercises at the end of each chapter provide practical ways for the reader to enter into this deeper relationship. Available through The Upper Room Spiritual Center. Keating argues that the spiritual journey is a gradual process of enlarging our emotional, mental, and physical relationship with the divine reality present in us. He discusses the fruits and gifts of the Spirit, but then relates them to the practices of contemplative prayer and living. Knowing God and knowing our deepest, truest selves go hand in hand. This book discusses how we may discover who God has called us to become, each a unique gift to the world. The book also explains how we mask our true identities through the false self. Finally, it provides practical suggestions for prayer that will lead us to deepening our knowledge and acceptance of both our truest selves and God. This book maintains that prayer is first and foremost a personal relationship and that fruitful prayer is that which builds upon and enhances relationship. It shows us how we can develop an intimate relationship with the Lord and provides various methods of prayer that will deepen our friendship with Christ Jesus. This book begins with the premise that most believers have not taken the notion of God’s unconditional love seriously. Love that is truly unconditional can never be withdrawn or withheld. This is a book of great wisdom, written simply, directly and humanly by a scholar and theologian. I have been reading this book for over three years. I keep going back to it because it is so deep and rich in reflections on the consistent, permanent love of God. The author writes about forgiveness, mercy, compassion, and resurrection. The book also has a meditation on the 10 Commandments that is very meaningful. We become like the God we adore. What if our God is shaming and abusive? We are then likely to shame and abuse ourselves and others. One of the easiest ways to heal ourselves is to heal our image of God so that we know a God who loves us at least as much as those who love us the most. Discusses whether God throws us into hell or otherwise vengefully punishes us, and the role of free will. Includes a question and answer section that gives the theological and scriptural foundation for the main text. A beautiful little book full of prayers and poems about deepening an intimate personal relationship with Jesus. The author speaks to our yearning to live congruent with our inner truth – in a world that is fragmented. Essential to this congruent life is learning to welcome the soul, and building communities and friendships that will support and sustain an integrated life. Palmer writes with intelligence, compassion, and an informed heart, often citing his own experience as valuable wisdom necessary for his growth. This book describes the emptiness in each person that can only be filled with God (the holy longing) and defines spirituality as how one chooses to live in response to that emptiness. The author is a Roman Catholic Priest and this book discusses foundational aspects of a Catholic (Christian) spirituality including private prayer life, social justice, mellowness of heart and communal worship. Other topics include incarnationality, the Paschal Mystery and sexuality. The author shares her experiences of walking with others through life’s challenges as their spiritual leader along with sharing the difficult obstacles she has overcome. This book offers much down-to-earth wisdom, humor and hope. A wonderfully written book, with short chapters, about our relationship with God. Do you know God or just know about God? Do you have a God without limits, or have you put God in a box with a sealed lid? These are some of the questions asked and answered in this gentle, affirming and thoughtful book. Readers are invited to discover their individual selves and their relationship with God through prayer, discernment, and reflective living. Written as an introduction to the Spiritual Exercises of St. Ignatius Loyola, this book can be helpful to newcomers to Ignatian Spirituality as well as those quite familiar with the Spiritual Exercises. Paul further develops the orientation captured in How Big Is Your God. Part I explores how God has pursued human beings to experience His presence and action and love; Part II explores human response options to God’s pursuit. Wonderful, thought-provoking, with powerful encouragement to dare to love. These readings explore life through everyday experiences of life force, judgment, traps, freedom, opening the heart embracing live, live and help live, knowing God in addition to mystery and awe. In each of these nine categories, Rachel unfolds for the reader an experience in her own life which gifts the reader with gems of wisdom in one’s own life and perhaps in the lives of others. This book was originally written to help a young Jewish friend cope with his agnosticism. The book did seem to help the friend, but Christian friends of Fr. Nouwen urged him to publish the book anyway. It has proven helpful for many Christian readers. Rupp shows us that prayer is a dance with the Divine, a joyous and hope-filled experience. Organized on a monthly basis, this book explores twelve major themes, each one followed by prayer suggestions. The author shares life experiences through readings of brief story and spiritual nourishment. Through these stories, a table of attentive openness and invitation is spread for the reader. The meaning of strength, refuge and belonging exceeds one set of beliefs, encompassing life and living. Martin’s memoir is wonderful, for it is testimony of the power of the saints in his own life. Very readable and with many subtle references to Ignatian spirituality interwoven, the book is a great resource for those whose spirituality is affirmed in learning about that of others. Perhaps the classic book regarding centering prayer. Anyone interested in centering prayer would do well to read this book. In these 153 pages packed with a response to the powerful and wise words from the Elders of the Hopi Nation in June of 2000. She receives and responds to each part of these wise words with a myriad of images, quotes, questions, poems, song lyrics as well as her reflection upon them. It is a powerful, guiding book! A classic, easy to read work describing how the primary call of all humans is to rely not upon ourselves, but rather to rely completely upon God, and how Jesus perfectly fulfilled this calling. Writing with great warmth and clarity, Tara Brach brings her teachings alive through personal stories and case histories, fresh interpretations of Buddhist tales and guided meditations. Step by step, she shows how we can stop being at war with ourselves and begin to live fully every precious moment of our lives. A reflection of Rembrandt’s painting, The Return of the Prodigal Son. Identifying with each of the three main figures in the painting, Nouwen describes a fresh interpretation of a classic story. The author shows us how to create special times of rest, and renewal – a refuge for our souls. With wonderful stories, poems, and suggestions for practice, he teaches us how we can use this sacred time to refresh our bodies and minds, restore our creativity, and regain our birthright of inner happiness. The book is applicable to a broad range of faiths and a wide range of readers. A powerfully written, thoughtfully presented story that elevates the reader to explore how the challenges of life can be turned into hopeful ways of living. Based on her personal lived story. Wonderful for meditation. Margaret Silf develops the image of life as a sea voyage to shed new light on the spiritual journey. The art of sailing life’s waters is explored with this delightful self-guided retreat. Her creative use of scripture, reflection questions, journal starters, and real-life seafaring wisdom enables readers to reflect on their experience with fresh insight. This gentle spiritual guidebook unites ancient spiritual practices with contemporary experience in a compassionate, enlightening manner that Christians of all faiths will appreciate. This is a delightful little book which is filled with everyday experiences of awe with the wonders of God. It is a meditation and prayer book which weds the holy seasons of the Church with images of walking barefoot in the grass, and other nostalgic memories. For someone looking for a resource to help them organize their prayer life with a daily discipline, this is an inviting text. A plan that can cultivate a daily habit. A must read. What an engaging story of healing and the power of God’s love! This book will likely challenge and expand your image of a loving, Trinitarian God and invite you deeper into that intimate love relationship. The authors recommend that every night we review our day in light to two questions: “What was I most grateful for? What was I least grateful for?” As we become more aware of moments that bring gratitude, we can more clearly see where God is calling us, because God wants us to do more of what brings us gratitude and love. The real-life anecdotes and the authors’ experiences are very inspiring and they make Ignatian spirituality accessible. This is an unconventional little book full of cartoon-like frames that help in clarifying the ways we can respond, awaken, be, see, look at life and living! It’s delightful, and full of wisdom for our journey, both in reflection and in practice. Deb uses few words and many pictures to come at our lives from various angles and perspectives. Try it on for size. Does prayer have to be silent? Does meditation have to be solemn? If I’m an extrovert, can I worship God? These are some of the questions that Nancy Reeves explores in this helpful, broadening book. This important book provides extroverts with ways of naming there own spirituality as well as introverts broadening their understanding of spirituality as beyond contemplative and quiet. A perspective needed for all! I Am Not Perfect is a simple statement of profound truth, the first step toward understanding the human condition, for to deny your essential imperfection is to deny yourself and your own humanity. The spirituality of imperfection, steeped in the rich traditions of the Hebrew prophets and Greek thinkers, Buddhist sages and Christian disciples, is a message as timeless as it is timely. This is a very helpful and hope-full book on spirituality, learning to love oneself “as is,” and nourishing the seeds of compassion. Pema encourages the reader to start (or continue) on the spiritual path rather than spending energy denying the painful parts of our past. This book explains the practice of Vipassana meditation, but much more than that. It explains how some of the fundamental considerations in Buddhism (and other religions for that matter) such as delusion versus reality, desire, and surrender of ego are extremely relevant to the teachings of Jesus and an authentic Christian life. This beautiful book brings comfort, healing, and affirmation through God’s gift of the natural world. It was written in Oliver’s later years after her partner’s death, and in spite of the losses that inevitably come to all of us, is a lovely, quiet celebration of life. This book emphasizes the importance of faithfulness to prayer – and makes a surprising and realistic suggestion for beginning. Sr. Melannie describes twenty specific indicators of a healthy spirituality including traits such as: Joy, Courage, Friendship, Perseverance, Balance, Gratitude and Playfulness. Each indicator features a meditation, questions for reflection, and a closing prayer. These twenty traits are equally inspiring for experienced pray-ers as well as for those just beginning. This book explores solitude, and the experience of the Desert Fathers and Mothers in the early centuries after Christ. It acknowledges that modern men and women cannot repeat that experience, but offers other alternatives for achieving solitude, peace and prayerfulness in today’s world. Here is what the Publishers Weekly says: “Written with a direct candor and compelling blend of psychological and spiritual insight, (Wayfaring) should appeal to both prayer novices and experienced practitioners. Tim Muldoon refers to Margaret as “a latter day Julian of Norwich.” Let Silf take you on a gospel exploration. This fine volume brings the reader new to the Ignatian tradition a clear way in and provides the more familiar practitioner valuable thoughts and clear insights flowing from the depth of Fr. Fleming’s experience as director, mentor and writer. A remarkable book. Buddhist teachings on ways to use painful emotions to cultivate wisdom, compassion, and courage; ways to communicate that lead to openness and true intimacy with others; practices for reversing negative habitual patterns; methods for working with chaotic situations; and ways to cultivate compassionate, energetic social action. Here are some of our favorite websites. Some of these are set up for daily or weekly use. The Bridges Foundation is a St. Louis based non-profit organization that offers the Spiritual Exercises of St. Ignatius of Loyola in everyday life, as well as related programs. The Center for Action and Contemplation in Albuquerque, New Mexico, which was founded in 1987 by Franciscan Father Richard Rohr. Here you can read articles by Richard Rohr, sign up for daily email meditations, and more. Contemplative Outreach is an organization that promotes centering prayer. On this website you can learn about upcoming workshops, programs, prayer groups and other resources. Creighton University Online. Wonderful meditations, the Spiritual Exercises and great links. Nouwen Society. Can sign up for daily meditation and weekly reflection e-letters. Ignatian Spirituality, a service of Loyola Press, a Jesuit Ministry. Prayer, spiritual direction, retreats and good decisions. Quite a comprehensive source for Ignatian Spirituality in today’s world. Your most important work may begin…after you retire. The Ignatian Volunteer Corps is a powerful blend of spirituality and service, inviting the volunteer to grow as he or she assists in meeting the needs of the underserved in our area. The Center for Liturgy at St. Louis University. Various reflections and information regarding the Sunday Scripture readings and preparing oneself throughout the week for these readings. Loyola Press three minute retreat offers quiet music, scripture, a reflection and two questions that lead the pray-er into some quiet time. British Jesuit website that provides music, scripture reading for the day, questions for personal reflection, and prayer. You can listen on your computer or download on your MP3 player. An invitation to make a “sacred space” in your day, to spend ten minutes, praying here and now, as you sit at your computer, with the help of on-screen guidance and scripture passage chosen specially each day. Unites States Catholic Bishops. Lists the Scripture readings (no reflections are provided) for any day you choose. A service of the Order of Preachers, offering audible daily reflections on the Christian scriptures. Preachers are drawn from the entire worldwide Dominican family–priests, brothers, sisters and lay people–all of whom are inspiring, theologically astute, dedicated to the Church and preaching the Good News, and acknowledged as excellent preachers. Reflections are also available via Podcast. This will be the first of eight parts of a most beautiful preaching by Henri Nouwen. We are all the Beloved of God. We are all taken, blessed, broken and given. Well worth the time to watch all eight parts. There are also a number of monthly publications. A monthly personal prayer periodical deeply rooted in the Catholic tradition, Give Us This Day supports your desire to establish prayer as a part of your life, enhancing your existing practices and deepening your encounter with God by providing: A practical approach to daily prayer; Prayers and readings for daily Mass; Daily prayer, Morning and Evening, and A reflection on the Scriptures for each day. Liturgical Press, P.O. Box 7500, Collegeville, MN 56321-7500, 800-858-5450, www.giveusthisday.org. Fenton, MO 63026, 636-305-9777, www.livingfaith.com. Includes lectionary scripture passages, a meditation and some comment on the life of a saint for each day. Also includes morning and evening prayers and two options for prayers at night which are an examen of the day. Additionally includes articles appropriate for the month. Magnificat USA, P.O. Box 822, Yonkers, NY 10702, 866-273-5215, www.magnificat.net. It is published bimonthly. One topic is chosen for each issue. There are 4 or 5 articles written by a variety of people on the selected topic. www.weavings.org. Includes daily meditations based on the lectionary scripture passages, inspirational essays and stories of the saints and other Christian heroes. The Word Among Us, 9639 Doctor Perry Road #126N, Ijamsville, MD 21754, 800-775-9673, wau.org. Looking for a retreat center in the area? Look here to find one. Jesus modeled for us so well that all of who we are and what we do first comes out of relationship with God, and it is important to nurture that relationship through private prayer. He would wake up early, stay up all night, take time out from the crowds and busyness to find a quiet and safe place. This collection of excerpts from Scripture illustrates this point. Many people who participate in our retreats are introduced to some of the spiritual principles and prayer techniques employed in the Spiritual Exercises of Ignatius of Loyola. The Spiritual Exercises is offered in everyday life by the Bridges Foundation. Countless people have found this retreat program to be a life changing experience of God’s love. Christian Life Community is a world-wide lay movement whose spiritual energy comes from Ignatian Spirituality. We are discerning communities for mission. At the end of all of our retreats, all participants and prayer guides offer this mutual blessing. May we accept more fully our beauty and belovedness. May we live in the moment, each moment of each day. May we come to see ourselves as God sees us. May we continue to encounter God in ways and in circumstances that challenge, surprise and delight us. May we be showered with the graces of empathy, forgiveness and freedom in all aspects of our lives. May we cooperate with God’s goodness, patience, kindness, gentleness and generosity. May the unique and special gifts of this retreat continue to nourish and strengthen us on our journeys. And may we continue to blossom as flowers of God’s love. We ask these blessings of our triune God: the God of ultimate mystery and boundless love, through Christ Jesus, in the Holy Spirit.